With dusty desert towns, tiny vineyards and even its own cowboys, visit Northwest Argentina and you’ll feel like you’ve landed in another era. It is said the American Wild West never died, just moved to Northwest Argentina . You’ll find splashes of colour in this desert region, such as the cliffs of the Quebrada de Humahuaca painted with the colours of the rainbow. 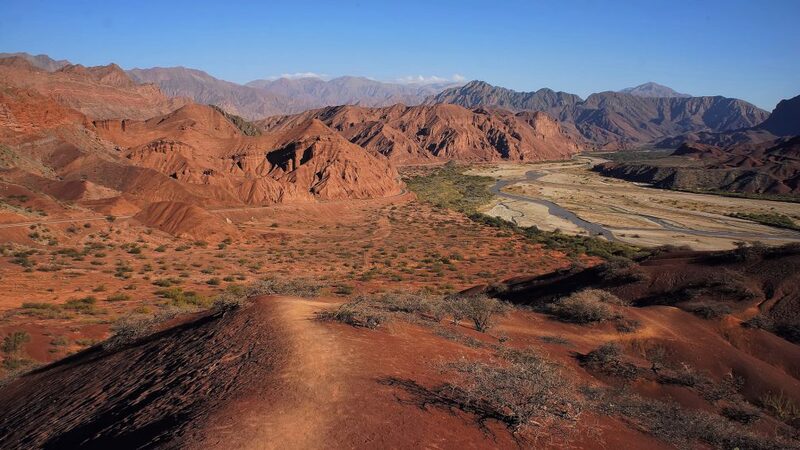 In addition, the vivid reds of the Cafayate will transport you to another world. Furthermore, the legacy of the Inca Empire is evident in the music, the food and the culture. While the majority of Argentinians are of European descent, the Andean Northwest retains a strong indigenous heritage. Head into one of many small, family-owned stores and sample such regional delights as locro, or empanadas salteñas. The gaucho is a legendary folklore figure who looks like he has stepped straight out of a fairytale and into real life. These nomadic Argentinian cowboys traditionally used to look after herds of cattle which roamed the country’s haciendas. You can’t miss them with their distinctive red ponchos, leather boots and embroidered tights. Today, they look after the herds of tourists who choose to visit Northwest Argentina by horseback. Disconnect from the ‘real’ world for a few days to enjoy an old-fashioned adventure in the company of a classic cultural hero. You’ll also ride through some of the best scenery that Argentina has to offer! Some of the very best wine in Argentina, if not the world, is produced in Cafayate’s desert bodegas. The desert lifestyle lends a certain laid-back charm to Cafayate, which, as a result, is a world away from the sometimes frantically touristic Mendoza. Also, this region is famous for its unique ‘wine ice creams’ – available in both red (Malbec) and white (Torrontes). For wine lovers, a wine tour of Cafayate in Northwest Argentina is an absolute must. Tour tiny family-owned vineyards, where the few thousand bottles of wine are made with love by hand. Or perhaps your prefer to discover wine-making on a more industrial scale at the larger, modern bodegas. In any case, enjoy the beautiful panoramic views of vineyards and dusty, arid landscapes. Purmamarca, Quebrada de Humahuaca, Hill of Seven Colours. The Quebrada de Humahuaca is a gorge which stretches some 100 miles through arid, dusty and unbelievably vibrant scenery. The gorge’s most famous sites feature names like ‘the Hill of Seven Colours’ and ‘the Hill of Fourteen Colours’, so you can be sure to see incredible hues streaking across jagged mountains. Visit Northwest Argentina to uncover a world of hidden jewels, such as the tiny village of Maimara. A beautiful little town often overlooked between Tilcara and Humahuaca, Maimara is placed between the incredible striped ‘painters’ palette’ mountains. These dusty, vivid red landscapes feature twisted rock formations, which are truly something to behold. Highlights include the Gargata del Diablo (Devil’s Throat), an immense gorge spectacularly carved by a long dried-up ancient waterfall. In addition, make sure you stop in at the Amphitheatre to see a truly uniquely designed building. Learning how to prepare empanadas in Cafayate , Salta , Peru. While empanadas are found all over the country, the empanadas in Northwest Argentina are truly special. These delicious packages of goodness, influenced by the region’s strong indigenous character, are regarded by some as the best in the country. Uniquely, the empanadas of Salta are made using only one circle of dough folded over, rather than two sides stuck together, as is the standard elsewhere. The legendary origins of this typical dish lie with a famous Salteña writer, Doña Juana Manuela Gorriti, whose family was forced to flee to Bolivia and sold empanadas to survive. As the story goes, their Bolivian customers renamed the empanadas salteñas due to their being made by women from Salta. Juana Manuela later put together a famous Latin American cookbook. Argentina’s Route 9 begins in Buenos Aires and stretches through seven separate provinces, all the way to Bolivia. In the Northwest, Route 9 is the vital main artery, connecting all the isolated desert towns. So hop on a Route 9 bus and you’re sure to end up somewhere spectacular! Tilcara is a vibrant and charming town in itself, but its main attraction is the magnificent Garganta del Diablo hike. This four kilometre stroll through a gorgeous canyon features plenty of photo opportunities, ending in a picturesque waterfall. The small village of Purmamarca sits underneath one of the most famous tourist attractions of the region: the Hill of Seven Colours. Yet choose to stay in the village and you will enjoy traditional houses, a thriving market and a pretty colonial churches, consequently making this a great spot to visit. Iruya is like something from a fairytale and has to be seen to be believed. Its beautiful colonial buildings in complementary shades of pastel are nestled perfectly between two mountains. The word ‘puna‘ comes from the Quechua meaning ‘a remote place difficult to live in’. However, it is the very isolation of this lesser-visited corner of Argentina which forms the basis of its appeal. Brightly-coloured mineral lagoons punctuate the dazzling white of the salt desert. The tops of mountains hide wonders like the Campo de Piedra Pómez, a labyrinth of white stones created by an immensely powerful volcanic explosion. This area is a photographer’s dream due to the light reflecting off the salt plains, which creates incredible optical illusions. Smart Salta, the region’s capital, boasts elegant colonial buildings in as many bright colours as the landscapes. Hence the pastel pink Cathedral and magenta and yellow Iglesia San Francisco are particular highlights. The city also boasts a number of outstanding museums. Make sure to visit the perfectly preserved Inca ice mummies at the Museum of High Altitude Archaeology. One of Salta’s most popular tourist attractions is the evocatively named Tren a las Nubes, or Train to the Clouds. This is also a miraculous feat of engineering which, in the right weather, soars above the clouds! While the train moves upwards through a series of hills, you can watch the landscapes run the full spectrum. As you visit Northwest Argentina, a pre-Colombian city in Argentina is a rare and fascinating thing. Hence the ancient city of Quilmes, which covers some 30 hectares and dates back to 850AD, is an impressive site. With a fortress carved into the very mountain it sits upon, from here the Quilmes people defended themselves first against the Incas, and then the Spanish. When the Spanish conquest became inevitable, the Quilmes people consequently fled to Buenos Aires. The descendants of the last few Quilmes led tours of the city, so they could teach visitors the history of their ancient ancestors. Salinas Grandes on Argentina Andes is a salt desert in the Jujuy Province. The beautiful Salinas Grandes are the remains of an ancient salt lake that dried up in prehistoric times. As a result, the contrast between the white salt flats and perfect blue sky is spectacular. In addition, the Salinas are surrounded on all sides by the Andes, a visually stunning contrast with the flat white salt. The Salinas Grandes are a fantastic alternative to Uyuni if you aren’t visiting Bolivia, or if you prefer less popular sites. Because very few tourists visit the Salinas Grandes, it’s likely you will have the huge expanse entirely to yourself. It is also the perfect place to take surreal perspective photographs, or you can simply relax and enjoy the magic of the landscape. Argentinian artisans (and not just those focused on wine!) have long favored Cafayate. Every day, artists from all over the country make the pilgrimage to Cafayate because they wish to draw inspiration from the unique landscapes. Contact us to discuss options for pottery classes in Cafayate, held by the area’s best artisans. Get back to nature and let your hands take control! Visit Northwest Argentina to explore the history of ancient times and the modern culture of locals. Due to the vast deserts, lagoons and volcanoes that bless this area, you will admire wildlife and geology of incredible beauty. Furthermore, photography lovers will relish in the rich and beautiful natural landscapes. While Northern Argentina is celebrated for its food, there are fabulous vineyards and wineries also located here. Yet another seven-day adventure that will enrich your spirit with beautiful landscapes along the way. As a result, the many different towns and awe-inspiring gorges will enchant you. In addition, you will have a chance to taste the most delicate and mouth-watering wines and delicious foods as well. Visit Northwest Argentina now to sample everything this wonderful region has to offer. Angastaco Nature Reserve in the Argentinian Andes. Having worked in travel for three years at home, I finally decided to set out and have my own adventure! Currently backpacking my way around South America armed with a camera and a pair of hiking boots.